Castlegar Max Ice Tournament March 10, 11, 12, interested? We are putting in a team for the Max Ice tournament in Castlegar March 10, 11, 12. The first 15 people to pay $60 to me will be on our Smokettes team. I have room at my house for about 6 people to stay the night Friday/Sat. Heidi will put the event on Bench App too. Thursday is Smokettes Picture Day! Come on time on Thursday February 2nd as we are going to take the yearly Smokette photo. Photo will be taken at 7:15pm sharp on the ice. Back row will be one colour, front row will be the other. Please find attached the volunteer sign-up and a list of what the duties are. Please e-mail Bridget at bridgetkivell at gmail dot com with your time slot. Note: Attachments are not working right now in blogger, will try to upload tomorrow, sorry. A new invite to the Max Ice Tournament in Castlegar arrived, the invite does not have a date for the tournament but I think it is the same weekend as Revelstoke. For the five other tournament we only have one tournament spoken for. If anyone really wants to go to any of the other tournaments, someone needs to organize or no tournament. Here is a summary. Feb 11 12 Kimberly - ??? Feb 24 25 26 Canal Flats - ??? March 10 11 12 Revelstoke - ??? March 10 11 12 assumed; Castlegar - ??? March 31 April 1 2 Nelson - ??? No Ice Saturday in Rossland; Let's Play Outside! Since we have been bumped from our Saturday night ice by a tournament let's all play together on the outdoor rink beside the arena in Rossland. Also a reminder of our participation in the Winter Carnival Parade on Friday January 27th in Rossland. Meeting spot is just above the court house on Columbia Ave at 6pm. Wear your jersey, bring your stick, a bag of wrapped candy, a light up ball and a positive spirit. See you there. Heidi, can you please add both of these to bench App. Hi, everyone! Our tournament is going to come up fast now! We have enough players this year to put in 2 Smokette teams. With how the schedule worked out, one of the teams will play 2 games (Smokettes 1) and the other will play 3 games (Smokettes 2). Players will pay $20/game and will be expected to provide either a salad or dessert (sign up will follow closer to the tournament) to go with the pizza on Saturday night. Barb and Bridget will be organizing the teams so please email Barb (barb_063 at hotmail dot com) with your preference and we will try to accommodate as many players as possible the rest will be determined by lottery. Here is a tentative schedule in case that helps you decide which team you would like to be on. Saturday January 14th in Rossland at 7:30 till 9pm has been opened up to Bring a buddy, come one come all! Wow, five possible tournaments...... anyone interested in organizing? 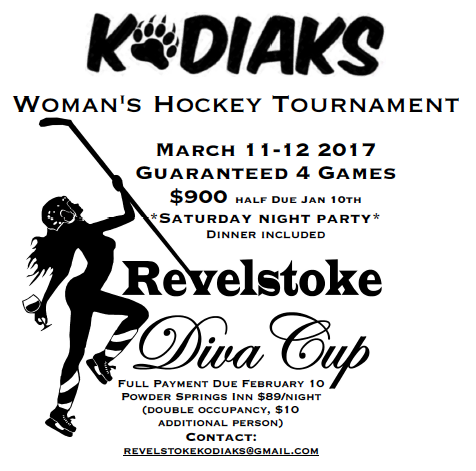 The Canal Flats Men’s team is having a tournament and they are extending the invite to 4 ladies teams for a women’s division. There are only 4 spots, so first come, first serve! 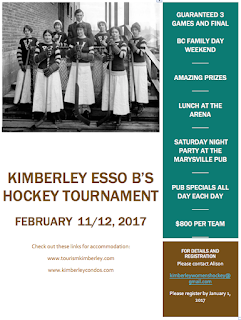 It’s a FUN hockey tournament in the quaint small-town of Canal Flats, British Columbia located in the East Kootenays. Fairmont Hot Springs Resort is only a 15 minute drive to the Canal Flats arena, and if you’re interested, let me know, I’ll see about a discount on rooms there. We have been notified of three tournaments in the next few months. Heidi can you please put them in BenchApp to see if we have interest and we also need someone to organize each of the three, any takers? 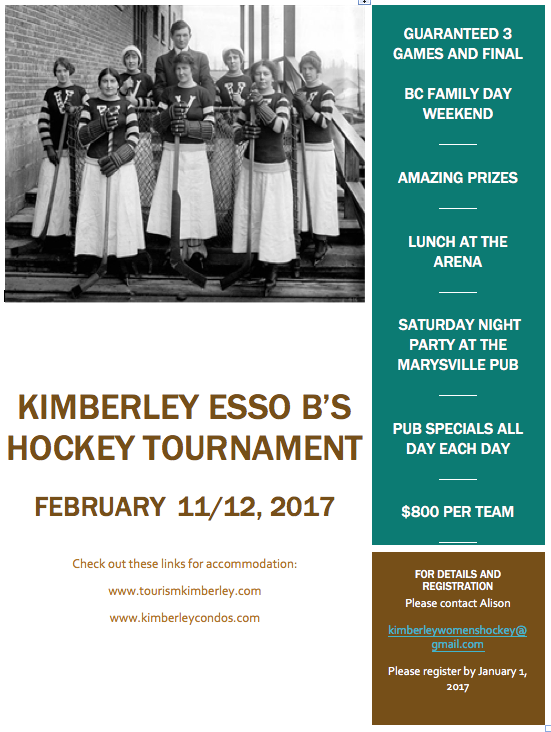 This is just a reminder about our tournament on February 11/12. We are busy planning for this fun tourney and want to thank those of you who have already committed. If you are thinking of coming, why not let us know as soon as possible? We would love to have you join us. The usual fun – full hockey games, with playoffs, and all the fun that Nelson brings.